Bees and Wasps swarming in a tree in your garden or around your home can be unnerving, especially if they establish a hive near your house. People who are not familiar with bees often have a fear of them because of their ability to sting. Swarming bees are generally not inclined to sting provided they are left alone – but the following precautions should be taken. Getting rid of these pests can sometimes be fearful, especially if you are allergic. A large nest may mean an attack and stings on you or other people in the area. Look for bees flying back and forth in a straight line. Use care when entering sheds or outbuildings where bees may be established. Examine work area before using lawn mowers, weed cutters, and other power equipment. Do not disturb a colony or swarm-contact a professional. Teach children to be cautious and respectful of ALL bees. Develop a safety plan for your home and yard. Be alert when participating in all outdoor activities. If you see bees entering a structure, it is an established hive regardless of how many or few bees are outside the hive. 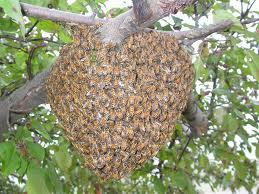 Most often when a swarm takes up residence in a structure, it goes unnoticed for the first year (or longer). This is because a new hive is very inconspicuous. It will only have a few bees coming and going every minute and is very easy to overlook, especially considering that bees build no external structure to their hive (as yellowjackets do). Do not attempt to remove a swarm yourself; swarms that have established in homes should be destroyed by a professional pest control expert. Have you got a dangerous beehive near your home? Call us today! Hiring a professional Minnesota pest control expert can mean safe and efficient handling of the wasps and bees.